South Asian immigrants and their unique health needs are often not part of the wider conversation in the United States. For instance, according to several studies, South Asian immigrants are 7 times more likely to have type 2 diabetes than the general population. Regular yoga, meditation and Ayurveda is taught at our centers and presents our seniors with holistic and healthful ways to exercise and maintain their physical and mental wellness. Falls Prevention: Every year we organize lectures and demos that model Home Safety measures and teach methods of Falls Prevention. 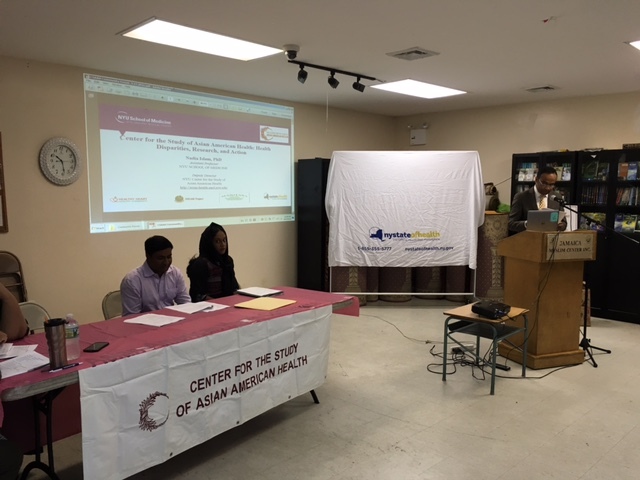 Keep On Track / Reach Far in collaboration with NYU Langone’s Center for the Study of Asian American Health (CSAAH) trained 26 volunteers at India Home to monitor blood pressure as part of a Community Health Assessment. Over 80 seniors from Desi Senior Center participated in the project. Nutrition Education: Another project helped to disseminate nutrition information with culturally and linguistically adapted brochures in Bengali and Hindi and taught them how to measure their food portions. 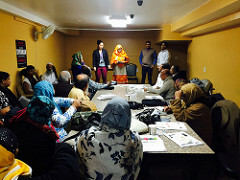 Nargis Ahmed, the Site Director for Desi Senior Center worked closely with the NYU team to get seniors to try these new nutrition strategies. 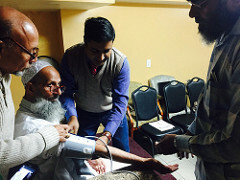 Health Materials in seniors’ languages: India Home and CSAAH worked in partnership with five area pharmacies to create linguistically adapted health materials in Hindi and Bengali, the languages spoken by our seniors. Healthy Substitution: CSAAH also launched a nutrition strategy by working with area restaurants in Jamaica to replace ingredients in common dishes so as to make them healthier. For example, switching white rice with brown in kitchurie ( a Bengali rice and lentil dish) increased its nutrition content. CSAAH has also partnered with local mosques to serve healthier foods for the iftar meal that breaks the Ramadan fast. The response from the community of seniors has been excellent. Even with all the barriers like work, taking care of grandchildren and busy lives, participants have been able to maintain the lifestyle changes they made as a result of the projects. India Home is happy to have done its part in improving the lives of our seniors. 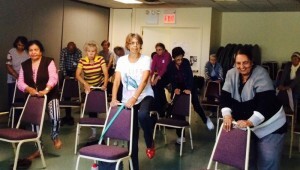 In the face of the rapidly growing older adult population of South Asian and diaspora seniors in New York City, India Home’s vision is to continue to be a leading resource to our seniors and agencies and institutions that are working to respond to their changing and emerging health and wellness needs.